On this page you will find examples of Don's creative work. The work may have been part of a larger project, like Become a Citizen Journalist, or may have been a collaborative project with students, such as Ladue Schools Today. Emmy award winning director and producer Jacqui Poor from HEC Media, sat down with Ladue High School adviser Don Goble and Senior student Marilyn Lercel to discuss Ladue Broadcast Technology's partnership with their professional programming, including their work on Educate.Today, what it takes to create broadcast quality work, and lessons learned from Marilyn by being pushed to improve from her adviser and the critiques from Jacqui and her teammate Tim Gore. Who will tell your story? In this short mini-keynote delivered at the annual iPadpalooza conference in Austin, TX, Don tells the stories of some of his aspiring students, with a surprise twist at the end. 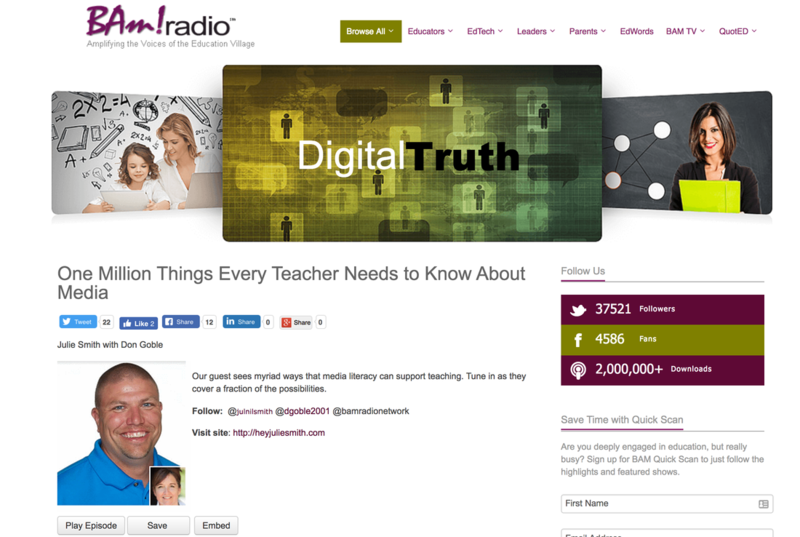 The Digital Truth Podcast, hosted by Julie Smith, interviews Don Goble about "​One Million Things Every Teacher Needs to Know About Media." Don sees a myriad of ways that media literacy can support teaching. Tune in as Don and Julie cover a fraction of the possibilities. The Front Row Podcast: Don Goble and Jon Rogers discuss video production techniques, online media, media literacy, and all things scholastic journalism. Listen to all the Front Row podcasts by selecting the individual episodes below. 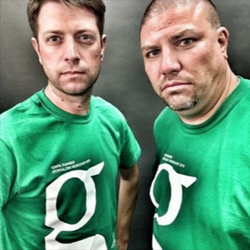 ​Podcast produced and edited by Don Goble and Jon Rogers. Recorded at the 2012 JEA Advisers Institute: Communication through the use of video is as powerful and exciting as it has ever been in our history. In this TED-style Talk, teacher Don Goble will share an incredible personal story from one of his former students, who started out to simply produce a video, but instead, made a global impact and ultimately changed the course of his life. This video was produced as the opening media for Don's book Interview an Expert. The video illustrates Don's teaching and his student's learning using iOS devices. Video was produced and directed by Don Goble. Cinematographer Marteana Davidson. Highlight video recapping the 2015-16 school year Don had with his students, and personally. The video was submitted as a part of the Apple Distinguished Educator application to attend the ADE Worldwide Institute in Berlin, Germany. Video was produced by Don Goble. Local St. Louis, MO artist Judith Shaw has received quite a bit of attention for her thought-provoking artwork. Judith's inspiration is sure to touch your soul. The incredible story of Marshall the Miracle Dog comes to life in this short documentary. Hear about Marshall's dramatic journey to personal healing and to the healing of others who meet him. Don modeled interviewing, capturing BRoll footage, and editing for his Broadcast Technology students. Video co-produced by Don Goble and Samantha Weil. Technical Director is Marteana Davidson. Public Service Announcement created for the Network of Employers for Traffic Safety, which is a non-profit organization dedicated to making roads safer through training. Video produced by Don Goble. From newspaper to yearbook, from broadcast to media/information literacy, journalism is one of the very best classes in the K-12 curriculum to deliver the 21st century skills of critical thinking, collaboration, communication and creativity. Don served as the lead editor of this collaborative video documentary for the Journalism Education Association. Don produced the video footage, edited, and supplied the opening and closing voiceovers for this virtual tour video of Ladue Horton Watkins High School. The purpose of the video was to supply the community with an overview of renovations that were needed and being discussed for an upcoming Bond Issue in the community. This video has received over 140,000 views.